(Reuters) - Britain's Sports Direct Plc <SPD.L> has pulled its offer to buy Patisserie Holdings Plc <CAKEP.L> after just two days, the Financial Times reported. In a letter on Sunday, Sports Direct wrote to cafe chain Patisserie Valerie's administrators, KPMG, complaining it lacked the information required to continue bidding for the group, the FT said https://on.ft.com/2URk6NA. 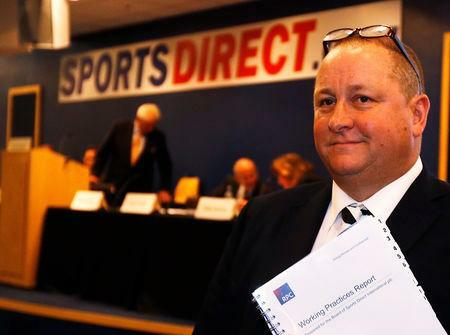 Chris Wootton, deputy chief financial officer for Sports Direct, wrote to David Costley-Wood, the KPMG partner leading the administration process, to say it had made a "serious and substantial offer" in excess of 15 million pounds, only to be told it would need to increase that offer by as much as 2 million pounds, the report said. In the letter seen by the Financial Times, Wootton said "SD has not been allowed access to a data room, any financial information or meetings with management". "SD has reluctantly decided to withdraw its offer for the businesses, as it is not able to match an offer of 18 million pounds plus without having access to any due diligence, financial information or management meetings," the letter said. British retail tycoon Mike Ashley's Sports Direct issued a statement on Friday which gave no details of its offer to buy the owner of cake specialist Patisserie Valerie. Ashley recently bought stakes in, or assets from, British retail businesses such as Debenhams Plc <DEB.L> and House of Fraser, Sofa.com, Evans Cycles and Agent Provocateur, companies that have struggled to cope with challenges including the rise of internet shopping and sluggish consumer spending.